Was $6,039 SAVE OVER $450 on a brand new 2016 Stock! So here’s the choice. You can be obliged to spend your time stuck on the bus stop, in the metro, searching for a parking place or you can have the freedom to choose and spend it as you like. It could just be the start of a better everyday life. 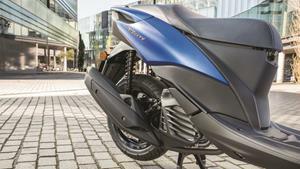 Everything about the Tricity 155 has been designed keeping you, urban commuters, in mind. Ideal for inexperienced riders, you can find your confidence on its 3 wheels, giving real feeling of stability on cobblestones and tram lines. Light and agile, Tricity 155 has the power to bring you further, push back the city’s limits letting you experience to the fullest the very best of urban life. Update the way you move. 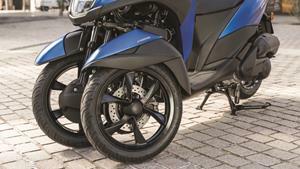 The 3-wheel layout of the Tricity 155 is an ideal choice if you are new to this type of riding. Its twin front wheels let you lean into corners and provide a high feeling of stability. And with two front tyres gripping the road and a wide 130 rear tyre - combined with dual disc brakes - the Tricity 155 inspires confidence on many surfaces. 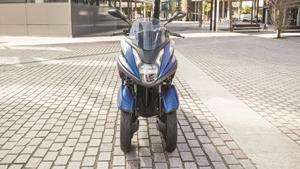 With its compact chassis, low weight and standard ABS, the 3-wheel Tricity 155 combines scooter-like agility with added riding confidence and feelings of stability. Its closely spaced front wheels mean that getting through traffic isn't a problem - and for added convenience there's a new parking brake. Door to door commuting made easy! The Tricity 155 is driven by our latest generation EU4-compliant 4-stroke engine featuring a Variable Valve Actuation system for faster acceleration with high levels of fuel economy. The responsive 155cc engine gives you the added power you need for highway and ring road use, making this an ideal short to mid range commuter. 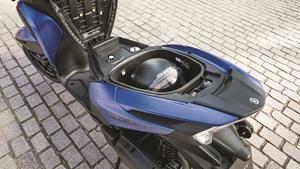 Beneath the high quality dual seat there's a large storage compartment designed to accommodate a full face helmet plus smaller items - and for added functionality the front storage pocket features a 12v outlet for charging various devices. With its large 7.2 litre fuel tank, the Tricity 155 gives an increased range between refills. With its sleek wind-beating cowl and beautifully styled bodywork, this is one of the most dynamic looking urban commuters. The wide and flat footboard combined with a long, high quality dual seat ensure comfortable urban commuting - and with its integrated passenger footrests and grab bar, the Tricity 155 is built for two! To underline the Tricity 155's good looks and contemporary style, it is equipped with a powerful LED headlight that illuminates the road ahead. Integrated front and rear flashers blend seamlessly with the dynamic bodywork, and for added presence in urban traffic, this new generation 3-wheel commuter comes with bright LED position lamps.